Part 1: Benefits of Abhyanga or Ayurvedic Self-Massage. Part 3: Best time to do Abhyanga and when NOT to perform Abhyanga. This particular blog is a continuation from Part 1. Here I will explain different types of oils for different dosha types, herbal oils vs. single oils, and how to perform a self-massage or Abhayanga. Ayurvedic massage oils are made from infusing herbs in base oils such as sesame seed oil or almond oil. There are also essential oil infused massage oils that are available. However to simplify the process I use single base oil such as coconut, almond, avocado, sesame seed or cacao butter to do “Abhayanga” or “Self Massage.” I will guide you which oil to use for your body type. If you know your dosha, it is easy to make the right choice. Herbal infused massage oils are preferred in Ayurveda because they contain blended herbs that are known for promoting stronger body and balancing the mind. 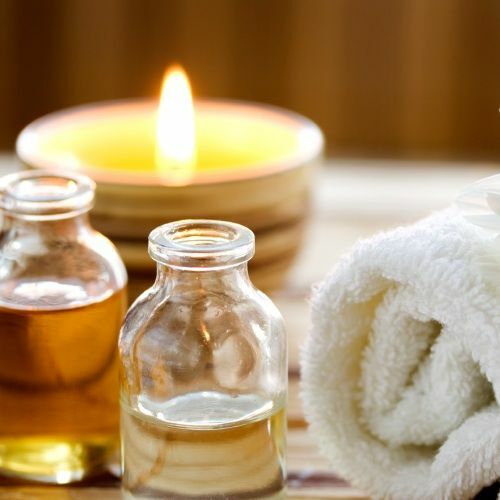 Imagine a daily massage with Ayurvedic herbal oil – specific for your body type! It will have twice the health benefits – benefits of the actual massage therapy and the healing power of the herbs. Choose cold pressed, extra virgin, chemical free and organic (if possible) oils to begin with. Vata Oil: Sesame seed and Almond oils are great to balance Vata dosha. Pitta Oil: Coconut or olive oil are best for cooling Pitta dosha. Kapha Oil: Dry skin brushing is most suitable for Kapha. Kapha has similar qualities like oils. Therefore best to use herbal oils for Kapha body massage and perform dry skin massage. Alternatively you can use sesame seed, almond or olive oil. I am a Kapha body therefore whenever I can I use Kapha Body Massage Oil or sesame seed oil. Caution: Oil is highly flammable. Use low heat to raise the temperature of the oil. Do not leave hot oil unattended. You can also purchase pre-cured oil from Ayurvedic store. I am looking to bring in some pre cured oil for Conscious Health’s shop. Stay tuned and I will let you know through newsletter or promotion. Keeping the skin lightly moisturized with oil will always keep the skin toned and elastic. Oil will also keep the body warm. I have learned to do a body massage from feet to neck. If you want to do a head to toe massage it is up to you. Feet: I start with my feet and always give it some extra time. After pouring the oil on my palm, I hold one foot at a time with my hands and rub my sole, fingers in between the toes and on the nails. Massage both underneath and top of the feet. I use circular motion to massage my ankle. Legs, thighs and Knees: Use long strokes to massage legs and thighs but circular motion for the knees. I go back and forth motion when massaging longer parts of the body. Chest, Stomach and Back: I use gentler circular motion when massaging chest and stomach area. I reach out for back and use longer strokes to apply the oil. Very gentle circular motion over the heart area and over the stomach or abdomen area begin from lower right to upper right – towards upper left to lower left area. I move my hand clockwise keeping in mind the bowel pattern. Arms, Elbows and Neck: Like legs I use long strokes for arms, circular motion for elbows and apply oil from the back of my neck to the front. I always pay attention and apply oil in between my fingers and over my nails. A weekly through body massage is a gift of self-care. On busier days you can do a quick massage. At the beginning it may seem like there is a lot to do but once you practice daily – it will be like a habit hard to skip, especially when you reap the benefits almost instantly. Coming up Part 3: Best Time to Perform Abhayanaga and when NOT to perform Abhayanga or Self-Body Massage. Find out what is your Dosha by taking the Dosha Quiz here. Let me know if this blog has helped you in anyway. Tell me which oil do you intent to use for self-massage. Share this post with your friends and family by clicking on the social media links. This is so interesting! I’ve been jonesing for a nice, relaxing massage but never would have thought about doing it at home. Right now it seems like I would be too focused on doing it right to relax! 😉 Looking forward to your next installment to learn more! Hi! The info provided is quite incredible and well scripted. I would love to know if there are any benefits of the old granny style of massage with mustard oil heated with garlic . If you are a Pitta Dosha mustard oil may not be right. And I believe the oils alone have great effect on the skin and immune system. Please use almond oil (Kapha), coconut oil (Pitta) or sesame seed oil (Vata). Mustard oil is also good for Vata-Kapha. Garlic infused oil is used if there is ear infections. I do not know about a whole body massage with garlic oil.